From its situation on top of a rocky promontory, there are magnificent views of Baiona, the Isles de Cies and the "Ria" leading into the busy port of Vigo. 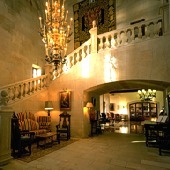 The Parador of Baiona has been built in the style of a Galician manor house within the walls of a medieval fortress. 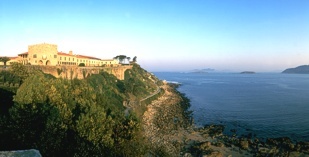 The fort was built to protect (not always successfully) the port of Baiona from enemies and pirates. Nestling below the Parador is the marina full of yachts from all over the world. It is a favourite landfall for yachts crossing the Atlantic and also for those going from northern Europe to the south Atlantic, the Mediterranean or crossing the Atlantic to the Caribbean Islands. It was here that the first ships arrived in Europe to tell the Europeans of the discovery of America across the ocean. A replica of this ship, Pinta, which was part of the fleet of Columbus, has her permanent home in the harbour. It is the focus point of a medieval carnival held every March to commemorate her arrival on 7 March 1493. Not many modern yachtsmen would like to cross the Atlantic on this small vessel! During the War of the Spanish Succession, the combined English and Dutch fleets sailed through these waters to the battle of Vigo in October 1702. It is believed that there is still a treasure ship on the bottom which was sunk while trying to escape from "fire ships" trying to set them ablaze. The focal point of this Parador Hotel is the splendid stone staircase that goes up from the entrance hall to the bedroom on the first floor. The public rooms reflect the theme of the large old fort being of grand proportions with the walls decorated with memorabilia. The Baiona Parador has regal and elegant common rooms in which decorative elements from other times are in abundance. Stately living rooms and spacious bedrooms, many with views of the sea, make up a grandiose interior in which a focal point is the splendid stone staircase in the entrance hall. This Parador has fifty eight twin bedded rooms, sixty two double bedded rooms and two easy access bedrooms. Many of the bedrooms have a view of the sea. 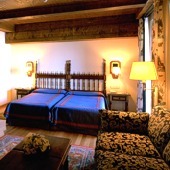 In the rooms you will find a private bathroom, a telephone, cable television, safe and a mini bar. The building is air conditioned and has central heating, restaurant, bar, gift shop, free internet access in communal areas, currency exchange, lift, satellite television, parking facilities (without security and limited places), garage and there are conference facilities. Facilities for the disabled are available. There is an outdoor terrace looking over the bay for drinks or light meals or alternatively a pleasant interior courtyard. 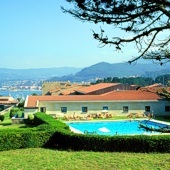 The Parador Baiona has a seasonal swimming pool, tennis court, garden, gymnasium, Jacuzzi, sauna and children's playground. "Tarta de Santiago y las filloas" being a cake from the ancient pilgrimage city of Santiago do Compostela and a type of pancake. The restaurant has a special glutin free menu but if you have this allergy it is worth checking that the various starters offered are also gluten free. While in Baiona, walk through the old parts of the town. see the Monte Boi wall, the Collegial church, and the ”Cruceiro” (stone cross) of Santisima Trinidad. A ferry boat runs across the Ria to the Isle de Cies where there are restaurants for lunch. The islands are a bird sanctuary with excellent sandy beaches. Activities in the area include diving, fishing, golf, horse riding, sailing, trekking and paragliding. A drive along the coastal road south of the Parador is spectacular. Visit the fishing harbour of A Guarda and the Celtic settlement on the top of Santa Tecla mountain. Return along the Mino valley where the Albarinho wine is produced. Cross into Portugal for tea in the 'forteleza' at Valenca before returning by the motorway. You will find differences of spelling of place names in the area since both Spanish and the old language of Galego are spoken in the region. Distance from the nearest airport is approximately 25 kms, train station is 22 kms away and the nearest port is 22 kms away. Wanted to stay at this Parador for a long time and finally my dream came true this October. Although we did not stay in a room with sea view, our room was large and comfortable overlooking a pateo with a fountain. The Parador is wonderful. The food in the restaurant was great and so was the service. Even the next day after a wonderful breakfast we were always greeted with a smile by the same restaurant staff. In teh morning we walked around teh Parador and it was amazing. So peaceful and beautiful. Will definitely return. During our travels in April & May 2014 we stayed in the Paradores in Bayona - beautiful location with vistas over the Atlantic with splendid, comfortable facilities. However we found several staff with low customer handling skills, although this did not reduce our enjoyment of this desirable location. Our second Paradore was in Leon where every aspect was excellent. The amazing building, luxury comfort and all important team of staff, all located as part of this impressive city. Our budget prevented us staying at more Paradores in Spain during our four week traveling holiday. Stayed at Parador Leon and in Baiona on our driving trip through France/Spain Switzerland, one of our most pleasant stays, we extended by a day! Baiona Parador was the best by far, it had beautiful surroundings, spectacular views, lovely room, great service and staff, and wonderful food. We have friends here in Australia who have been to Spain several times and did not know of the existence of the Paradors, (as we did not). These would be very popular with Australians if they were more widely known! Luxury Parador hotel in the old walled fort protecting (not always successfully!) the Port of Baiona.